Nial Watson, the grandson of John Alexander Sinton VC, has presented the School of Medicine, Dentistry and Biomedical Sciences at Queen’s with a film biography and archive of his late grandfather, who attended Queen's College and graduated from the Royal University of Ireland* with a Bachelor of Medicine (1st Class), Bachelor of Obstetrics (1st Class) and Bachelor of Surgery (2nd Class) in 1908. The short DVD biography, which was produced by and in association with Friends of the Somme Mid-Ulster Branch, Cookstown, mostly relates to his work as a doctor and researcher with the League of Nations Malaria Commission and is in addition to a personal film archive which contains over 9 hours of footage. Speaking at the informal handover, Nial Watson said: “My grandfather was a remarkable man, who over 50 years had close ties to Queen’s, his alma mater. Through his work as a virologist and researcher with the League of Nation's Malaria Commission, he was an avid archivist and film maker. “A very proud graduate, not to mention former member of both staff and Senate, we, his descendants, thought it most appropriate that a copy of this DVD should be donated to the Medical School where his career began,” he added. Receiving the collection on behalf of the University, Professor Pascal McKeown, Acting Head of the School of Medicine, Dentistry and Biomedical Sciences at Queen’s, said: “John Alexander Sinton is one of this University’s – and Northern Ireland’s – most illustrious sons. A distinguished figure in the medical world and military field, his achievements were many and he is remembered with great respect and awe not just at Queen’s but around Northern Ireland and in India, Australia, Burma and the Solomon Islands. Martin Brennan from Friends of the Somme who was supervisor and producer on the project told Queen's: "The film archive is owned by the Watson Family (Nial Watson and his children) and is held in storage by Friends of the Somme Mid Ulster Branch in perpetuity. "The original film stock was for the most part in monochrome from the 1920s until the late 1940s with occasional film in colour from then onwards. There are nineteen 7" reels of double perforation 16mm film, which were digitised on to 4 discs in DVD format. "While not intended for public sale but for academic, education and historical use only, permission has been granted to Queen's and to Royal Belfast Academical Institute to use the contents of both the documentary and the film archive." Born into a Quaker family on 2 December 1884 in Victoria, British Columbia, Canada, John Alexander Sinton (known by most as Jack) was the third of the seven children (one brother and five sisters) of Walter Lyon Sinton (1860–1930) and Isabella Mary Sinton (née Pringle, 1860–1924) both of whom came from Northern Ireland. The family had extensive interests in the linen trade in the north of Ireland and in 1890, when Jack was just 6-years-old, the family returned to Ireland and lived in Portadown. Not long after, Walter Sinton left his wife and family and returned to North America. Jack attended Nicholson Memorial School (run by the Quaker community) in Lisburn before transferring to the Royal Belfast Academical Institution (RBAI) or Inst. in 1899 and then to Queen’s where he studied medicine. In 1910 he was awarded the Diploma in Public Health (with a £10 prize) by Cambridge University and was the Riddel Demonstrator of Bacteriology at Queen’s under Professor Symmers. As a precursor to a commission as Lieutenant (Medical Officer) with Medical Service of the Indian Army, he studied at the School of Tropical Medicine in Liverpool, where he took first place in the examinations. Attached initially to the 31st (Duke of Connaught’s Own) Lancers, he requested a transfer to an active service unit and was posted to the 37th (Prince of Wales’ Own) Dogras. The action for which he was awarded the Victoria Cross occurred on 21st January 1916 at the Orah Ruins in Mesopotamia, where, though hit by rifle fire five times in both arms and in the side he refused to go to hospital and tended to the wounded under heavy fire and without regard for his own safety, until nightfall brought a cessation of hostilities. Captain Sinton was the first Queen’s College/Royal University of Ireland graduate*, and the first Irish medic, to be awarded the Victoria Cross. In January 1923, Jack Sinton was promoted to Major and, on 19th September, he married Eadith Seymour Steuart-Martin. Their daughter, Eleanor Isabel Mary Sinton, was born at Kasauli in the Indian state of Himachal Pradesh, on 9th December 1924. Jack Sinton also achieved international pre-eminence as a malariologist, publishing more than 200 scientific papers, many of them about malaria. The first Director of the Malaria Survey of India (now the Malaria Institute of India and one of the chief malaria research centres in the world) Jack spent the next 15 years researching the treatment of malaria before retiring from the Indian Medical Service in 1938. Queen’s awarded him a DSc – a Doctorate in Sciences – for his work on the phlebotomus, a genus of sand fly, in 1927. At the start of World War Two, he joined the Home Guard as a Private, but was soon recalled by the War Office and spent the remainder of the war as a peripatetic advisor on malaria control. As a Brigadier, he served in India, East Africa, the Middle East and, in 1944, he oversaw the treatment of an outbreak of malaria in southern Italy. Jack Sinton went on to become both a member of the Senate of Queen's (the University’s governing body) from 1947-1956 and a Pro-Chancellor of the University (1952-1956), and also served as a JP, High Sheriff and Deputy Lieutenant of Co Tyrone. In October 1970 the University named one of its then new state-of-the-art halls of residence (Sinton Hall) in his honour. A distinguished figure in the medical world and military field, the achievements of Jack Sinton were celebrated earlier this year with the unveiling of an Ulster History Circle blue plaque, by Nial Watson, at Lissan Parish Church in Cookstown, exactly 61 years after his eminent grandfather’s funeral. Brigadier Sinton died at his home, Slaghtfreedan Lodge in Cookstown, Co Tyrone, at the age of 72, on 25 March 1956. He was buried with full military honours at the nearby Claggan Presbyterian Cemetery. Further details on the life of John Alexander Sinton VC can be found on Wikipedia and on the Dictionary of Ulster Biography website. The Sinton DVDs are available to view in Special Collections & Archives in The McClay Library. *Queen’s College became Queen's University Belfast - a university in its own right - in 1908, before which it was part of the Royal University of Ireland. 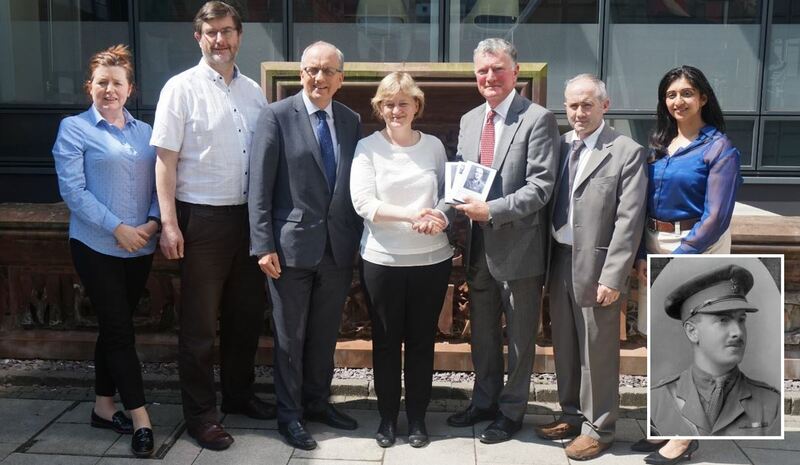 Photo (L-R): Catherine McKeown (School Manager), Dr Ultan Power (Senior Lecturer), Professor Pascal McKeown, Ursula Mitchel (University Archivist), Nial Watson, Martin Brennan, (Vice-Chair, Friends of the Somme Mid-Ulster Branch) and Natasha Sharma (Alumni Relations Officer, Queen’s University). Inset: Brigadier John Alexander Sinton.